Management of the child with multiple traumatic injuries can be challenging, and important injuries may not be readily recognized. Early recognition of serious injuries, initiation of appropriate diagnostic studies, and rapid stabilization of injuries are key to decreasing morbidity and mortality in the multiply injured pediatric trauma patient. The differential diagnosis for these patients is wide, and treatment is targeted to the specific injuries. In this issue, a systematic approach to the multiply injured pediatric patient will be reviewed, with specific attention to commonly missed injuries and those injuries that may cause significant morbidity or mortality. A 12-year-old previously healthy boy presents to the ED via EMS for a visible deformity of his right arm. His 18-year-old brother was pulling him around in an inner tube that was attached by a long rope to a truck traveling about 40 miles per hour through a lightly wooded area. His brother made a sharp turn, and the patient went flying off the inner tube and hit a tree. The brother said that the patient did not lose consciousness, but that he was “stunned” for a few seconds, then started complaining about his right arm. The patient said he was not wearing any personal protective equipment. He has multiple abrasions to his face, trunk, and extremities. He denies pain anywhere except in his arm. He requests to have his neck brace removed because it is “annoying.” He denies vomiting but reports feeling nauseous after receiving morphine from the paramedics en route to the hospital. Because this was a severe mechanism, though the patient appears to have an isolated injury, you begin to consider how much you should do. Should you “pan-scan” the patient and draw labs because of the mechanism? What other imaging studies do you need to obtain besides an x-ray of the arm? Is the patient at risk for internal bleeding due to this blunt impact? Should you consult the surgeons or just call the orthopedist to reduce the obvious fracture? A 16-month-old previously healthy girl presents to the ED via EMS after a seemingly accidental fall out of a third-story apartment window. Onlookers said the girl fell into a bush and appeared stunned but did not lose consciousness. The mother says when she got downstairs, the child was crying but easily consoled. The girl has multiple abrasions all over her body and a bloody nose, but otherwise seems fine. She cries throughout the primary and secondary surveys. Is the crying merely developmentally appropriate stranger anxiety? Does this patient need labs drawn? What type of imaging is warranted? If no other injuries are identified, what is the appropriate disposition for this patient? Typically, major issues with airway, breathing, and circulation are recognized and stabilized in a timely fashion. Problems occur when TBIs and orthopedic injuries are not identified early, as they can lead to long-term disabilities in pediatric patients.2,6 In one study, 9% of injuries were initially missed in pediatric trauma patients, with 46% of those injuries being missed fractures. Earlier identification of these injuries can greatly decrease the rates of morbidity and mortality. Other organ systems in which certain missed injuries can lead to serious morbidity in multiple-trauma patients include the gastrointestinal and respiratory systems.6 Less common pathologies, such as abdominal compartment syndrome,3 if not recognized early, can lead to a decline in respiratory status and decreased cardiac output. Blunt chest trauma can cause morbidity primarily from lung contusions or hemothorax/pneumothorax or secondarily as a result of a systemic inflammatory response syndrome leading to acute lung injury. This issue of Pediatric Emergency Medicine Practice will discuss evidence-based recommendations for early recognition of TBI during the primary survey, initiation of the proper imaging to diagnose injuries, expedient stabilization of injuries, and utilization of a systematic approach to manage pediatric patients with multiple trauma. The search of the literature revealed few case reports on multiple trauma in pediatric patients; there were also few studies on the emergency medical management of these cases. There were more studies that focused on the surgical management of multiple trauma patients, including emergency surgical procedures and early involvement of surgical specialties in resuscitation. The studies were retrospective, with very few prospective or randomized double-blinded studies. Commonly missed injuries in pediatric trauma patients include fractures, intracranial injuries, intra-abdominal injuries, retained foreign bodies, and peripheral nerve injuries. Algorithmic progression through the ABCDEs (see Figure 1) of the primary survey will help identify and address life-threatening injuries. In children aged < 12 years, maintain suspicion for SCIWORA (spinal cord injuries without radiographic abnormalities) and document a thorough neurologic examination in high-risk patients. The Pediatric Glasgow Coma Scale allows clinicians to obtain, track, and communicate the mental status and level of consciousness in preverbal children aged ≤ 2 years. The PECARN Pediatric Head Injury Prediction Rule is a well-validated clinical decision aid that allows clinicians to safely rule out the presence of clinically important traumatic brain injuries. The Pediatric Glasgow Coma Scale allows clinicians to obtain, track, and communicate the mental status and level of consciousness in preverbal children aged ≤ 2 years. The Pediatric Glasgow Coma Scale (pGCS) is a variation of the standard Glasgow Coma Scale (GCS), with age-appropriate modifications to the motor and verbal components. Like the standard GCS, the pGCS score range is from 3 to 15, with components for eye opening, verbal response, and motor response. The total score should be reported with the scores of each of the individual components because of the difference in prognostic value and variations of individual components versus the summed score. For example: Total pGCS score of 12 = E3 + V4 + M5 (Healey 2003). The pGCS is as accurate for identifying clinically important traumatic brain injury (ciTBI) in preverbal children as is the GCS in verbal children. It is best to obtain a pGCS score before the administration of analgesics or other interventions that could alter the score. The pGCS is slightly less accurate in identifying patients with traumatic brain injury (TBI) visible on computed tomography (CT) compared to the GCS in older children (Borgialli 2016). cannot be obtained, consider using the FOUR (Full Outline of UnResponsiveness) score. This is a validated, expanded scoring system (Wijdicks 2005, Sadaka 2012). The distinction between normal and abnormal flexion may be challenging, especially for the nonspecialist (Reilly 1991). The pGCS allows for calculation of a GCS score in preverbal children, for whom some of the components in the standard GCS cannot be measured. The standard GCS is a component of several prognostic and clinical decision-making tools, including the PECARN Pediatric Head Injury/Trauma Algorithm, the Revised Trauma Score, the Age-Specific Pediatric Trauma Score, and the Canadian CT Head Injury/Trauma Rule. Use the pGCS for patients aged ≤ 2 years with head trauma, altered mental status, or neurologic abnormalities. The pGCS can be used in initial and serial assessments. The pGCS score can be used to assess and track a patient’s mental status and level of consciousness. However, as with the standard. All patients with either a pGCS or standard GCS score < 15 need appropriate monitoring, and all patients with concern for mental status or neurologic compromise should be closely monitored and reassessed as needed. The pGCS was evaluated in a subanalysis of a large, prospective observational multicenter cohort study of children with blunt head trauma, to compare the accuracy of the pGCS in preverbal children (aged ≤ 2 years) to the standard GCS score in older children (aged > 2 years) for identifying patients with TBIs after blunt head trauma (Borgialli 2016). The study demonstrated statistically similar test performance for the pGCS and the standard GCS in identifying patients with ciTBIs. The pGCS had slightly lower accuracy than the standard GCS in identifying patients with TBIs visible on CT. With a 95% confidence interval, the area under the receiver operating characteristic curve for the association between GCS score and ciTBI was 0.77 for the pGCS cohort and 0.81 for the standard GCS cohort. The area under the receiver operating characteristic curve for the association between GCS score and TBI visible on CT was 0.61 for the pGCS cohort and 0.71 for the standard GCS cohort. Interobserver agreement in each cohort for the total score and all individual score components met the criteria for at least moderate interobserver agreement (kappa 95% lower confidence limit > 0.4). Limitations of the study included an age threshold of ≤ 2 years to define the preverbal pediatric population and the fact that only 36% of the study population underwent cranial CT imaging, so it is possible that some of the children who did not undergo imaging might have had traumatic findings on CT.
James HE. Neurologic evaluation and support in the child with an acute brain insult. Pediatr Ann. 1986;15(1):16-22. Borgialli DA, Mahajan P, Hoyle JD Jr, et al. Performance of the Pediatric Glasgow Coma Scale Score in the evaluation of children with blunt head trauma. Acad Emerg Med. 2016;23(8):878-884. Healey C, Osler TM, Rogers FB, et al. 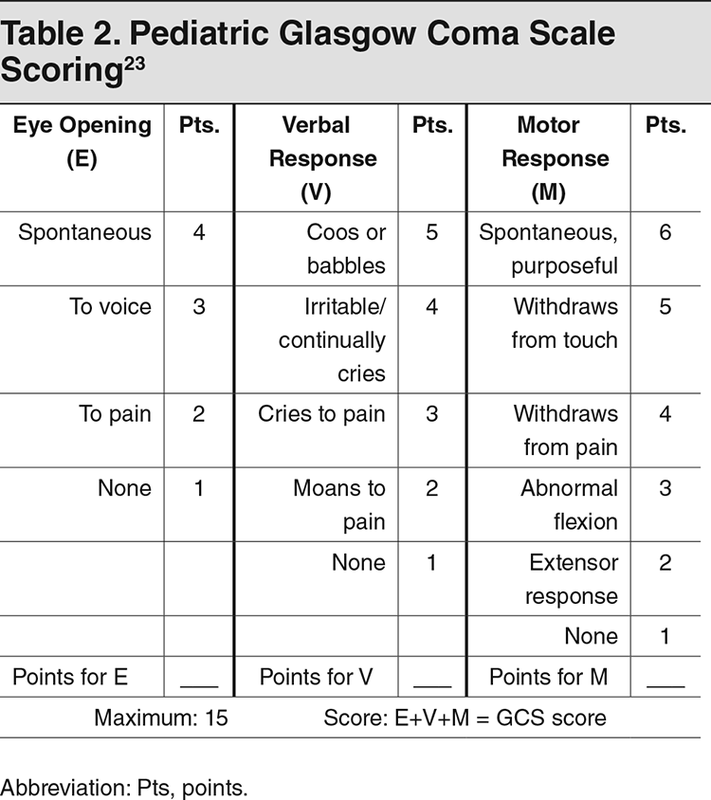 Improving the Glasgow Coma Scale score: motor score alone is a better predictor. J Trauma. 2003;54(4):671-680. Wijdicks EF, Bamlet WR, Maramattom BV, et al. Validation of a new coma scale: The FOUR score. Ann Neurol. 2005;58(4):585-593. Sadaka F, Patel D, Lakshmanan R. The FOUR score predicts outcome in patients after traumatic brain injury. Neurocrit Care. 2011;16(1):95-101. Teasdale G. Forty years on: updating the Glasgow Coma Scale. Nursing Times. 2014;110(42):12-16. Simpson D, Cockington RA, Hanieh A, et al. Head injuries in infants and young children: the value of the Paediatric Coma Scale. Childs Nerv Syst. 1991;7(4):183-190. The PECARN Pediatric Head Injury Prediction Rule is a well-validated clinical decision aid that allows clinicians to safely rule out the presence of clinically important traumatic brain injuries. The Pediatric Emergency Care Applied Research Network (PECARN) consortium produced the largest study, to date, aiming to derive and validate clinical prediction rules to identify children with very low risk of clinically important traumatic brain injury (ciTBI) following blunt head trauma, who would not require imaging. ciTBI was chosen as the primary outcome because it is clinically driven and accounts for the imperfect test characteristics of computed tomography (CT). In the group of patients aged < 2 years, the rule was 100% sensitive. In the group of patients aged ≥ 2 years, the rule was 96.8% sensitive. In patients aged < 2 years with a Glasglow Coma Scale (GCS) score ≥14 or other signs of altered mental status, or palpable skull fracture, the risk of ciTBI was 4.4%, and CT imaging is recommended. Risk of ciTBI in this age group was 0.9% with the presence of any of the other 4 predictors (occipital or parietal or temporal scalp hematoma, history of loss of consciousness for ≥ 5 seconds, severe mechanism of injury, or patient not acting normally according to the parents), and < 0.02% with no predictors. In patients aged ≥ 2 years with a GCS score ≥ 14 or other signs of altered mental status, or signs of basilar skull fracture, risk of ciTBI was 4.3%, and CT imaging is recommended. Risk of ciTBI in this age group was 0.9% with the presence of any of the other 4 predictors (history of loss of consciousness, history of vomiting, severe mechanism of injury, or severe headache), and < 0.05% with no predictors. Although it was the largest trial of its kind, the PECARN study had low rates of traumatic brain injury (TBI) on head CT scan (5.2%) and even lower rates of ciTBI (0.9%), suggesting that overall TBI in children is rare. Head CT scans were obtained in approximately 35% of patients, which was lower than the average estimate of 50% (Kupperman 2009). The PECARN Rule outperformed both the CHALICE (Children's Head injury Algorithm for the prediction of Important Clinical Events) and CATCH (Canadian Assessment of Tomography for Childhood Head injury) clinical decision aids in an external validation study (Easter 2014). Unlike in the adult population, CT imaging of the head in pediatric patients is believed to be associated with an increased risk of lethal malignancy over the life of the patient, with the risk decreasing with age. The estimated lifetime risk of lethal malignancy from a head CT scan for a 1-year-old patient is 1 in 1000 to 1 in 1500, with risk decreasing to 1 in 5000 for a 10-year-old patient. There are over 600,000 ED visits annually in the United States for head trauma among patients aged ≤ 18 years. Applying the PECARN Pediatric Head Injury Prediction Rule allows clinicians to determine which pediatric patients can be safely discharged without a head CT scan. The PECARN Rule is a well-validated clinical decision aid that allows clinicians to safely rule out the presence of ciTBI among pediatric head injury patients without the need for CT imaging, including patients who would require neurosurgical intervention. The PECARN Rule only applies to children with GCS scores ≥ 14. In patients with suspected or radiologically confirmed TBI, first assess the ABCs (airway, breathing, circulation) and consider neurosurgical and/or intensive care unit consultation or local policies for fluid management, seizure prophylaxis, hypertonic saline/mannitol, disposition, etc. Consider observation for 4 to 6 hours for patients who do not undergo CT imaging, in order to assess for changes in clinical status. Reassurance, education, and strict return precautions are warranted for patients discharged without imaging, including direction to follow up with a primary care provider or neurologist, and anticipatory guidance on return to play/school if concussion is suspected. In the original PECARN study, ciTBI was a rare event (0.9%), and neurosurgical intervention was even more rare (0.1%). Over 50% of each age cohort did not have any predictors, and CT imaging is not indicated for the vast majority of these patients, as risk of ciTBI was exceedingly low. Risk of ciTBI was > 4% with either of the 2 higher-risk predictors in each age cohort, and imaging is recommended for patients with these predictors. For the remaining 4 lower-risk predictors in each cohort, the risk of ciTBI is approximately 0.9% per predictor; for patients with any of these risk factors, CT imaging is indicated rather than observation. Judgment may be based on clinical experience, single versus multiple findings, signs of clinical deterioration during the observation period, patient age, and/or parental preference (Kupperman 2009). The original PECARN study included 42,412 children aged < 18 years presenting to any of the 25 North American PECARN-affiliated emergency departments (EDs). There were 33,785 patients in the derivation cohort (8502 of whom were aged < 2 years) and 8627 in the validation cohort (2216 of whom were aged < 2 years). CT scans were performed at the physician’s discretion for 35.3% of the patients, while medical records, telephone surveys, and county morgue records were used to assess for cases of missed ciTBI in patients discharged without imaging. The potential for CT reduction quoted above is likely underestimated, given that CT utilization in this study (35.3%) was significantly lower than the estimated average in North American EDs (50%). Among the patients who had CT imaging, 5.2% had TBI visible on CT.
Nine percent of the patients in the study were admitted to the hospital, 0.9% had ciTBIs, 0.1% underwent neurosurgery, and 0 died. Among the 376 patients with ciTBIs, 60 patients (15.9%) underwent neurosurgery, 8 patients (2.1%) were intubated for > 24 hours, and 0 patients died. In patients aged < 2 years who were negative for any PECARN risk factor, the decision aid was 100% sensitive (95% confidence interval, 86.3-100) with a negative predictive value of 100% (95% confidence interval, 99.7-100) for ruling out ciTBI in the validation cohort. In patients aged > 2 years who were negative for any PECARN risk factor, the aid was 96.8% sensitive (95% confidence interval, 89.0- 99.6) with a 99.95% negative predictive value (95% confidence interval, 99.8-99.99) for ruling out ciTBI in the validation cohort. As a result of the infrequency of ciTBI, the lower bounds of the confidence intervals of sensitivity started at 86% and 89%, respectively, for the cohorts of patients aged < 2 years and ≥ 2 years. The negative predictive value confidence intervals very closely approximated 100%. Although the goal was to rule out patients with very low risk of ciTBI, the PECARN Rule also performed well to rule out TBI on head CT. In patients aged < 2 years, sensitivity and negative predictive value were 100% for TBI on CT, with narrow confidence intervals. In patients aged ≥ 2 years, sensitivity was 94% and negative predictive value was 98.4% for TBI on CT, with narrow confidence intervals (Kupperman 2009). The PECARN Rule has now been externally validated in 2 separate studies. A trial of 2439 children in 2 pediatric EDs (1 in the United States and 1 in Italy) found the PECARN Rule to be 100% sensitive for ruling out ciTBI in both age cohorts (patients aged < 2 years and ≥ 2 years). The rates of 0.8% of patients (19 of 2439) with ciTBI and 0.08% of patients (2 of 2439) requiring neurosurgery were similar to the rates in the PECARN trial (Schonfeld 2014). A second trial involving 1009 patients aged < 18 years at a single United States ED prospectively compared the PECARN Rule to 2 other pediatric head CT decision aids, CHALICE and CATCH, as well as to physician estimates and physician practice. In this sample, 2% of patients (21 of 1009) had ciTBI and 0.4% of patients (4 of 1009) needed neurosurgery. Again, the PECARN Rule was found to be 100% sensitive for identifying ciTBI. The PECARN Rule outperformed both the CHALICE and CATCH decision aids, which were 91% and 84% sensitive for ciTBI, respectively (Easter 2014). Two PECARN Rule subgroup analyses attempted to furth er risk stratify patients who had single predictors. In a subanalysis of patients aged < 2 years with scalp hematomas and no other PECARN predictors, ciTBI was too uncommon to apply age, hematoma size, or hematoma location predictors. There were several non–statistically significant trends for higher rates of TBI on head CT scans that may affect imaging tendencies (eg, age < 3 months, nonfrontal hematoma location, and increased hematoma size) (Dayan, Holmes, Schutzman, et al 2014). Another subanalysis of patients aged > 18 years who had vomiting and no other PECARN predictors reiterated the parent study results. In the cohort of patients aged ≥ 2 years, there was a low rate of TBI on head CT (3.2%, 26 of 806 patients) and an even lower rate of ciTBI (0.7%, 10 of 1501 patients), so observation rather than emergent imaging was indicated in the majority of these patients. The number of vomiting episodes and timing of those episodes was not helpful in predicting ciTBI or TBI on head CT, as there was a non–statistically significant counterintuitive trend towards less ciTBI/TBI on CT with more episodes (Dayan, Holmes, Atabaki, et al 2014). Kupperman N, Holmes JF, Dayan PS, et al. Identification of children at very low risk of clinically-important brain injuries after head trauma: a prospective cohort study. Lancet. 2009;374(9696):1160-1170. Schonfeld D, Bressan S, Da Dalt L, et al. Pediatric Emergency Care Applied Research Network head injury clinical prediction rules are reliable in practice. Arch Dis Child. 2014;99(5):427-431. Easter JS, Bakes K, Dhaliwal J, et al. Comparison of PECARN, CATCH, and CHALICE rules for children with minor head injury: a prospective cohort study. Ann Emerg Med. 2014;64(2):145-152, 152.e1-152.e5. Brenner D, Elliston C, Hall E, Berdon W. Estimated risks of radiation-induced fatal cancer from pediatric CT. AJR Am J Roentgenol. 2001;176(2):289-296. Dayan PS, Holmes JF, Atabaki S, et al. Association of traumatic brain injuries with vomiting children with blunt head trauma. Ann Emerg Med. 2014;63(6): 657-665. Dayan PS, Holmes JF, Schutzman S, et al. Risk of traumatic brain injuries in children younger than 24 months with isolated scalp hematomas. Ann Emerg Med. 2014;64(2):153- 162. Hess EP, Wyatt KD, Kharbanda AB, et al. Effectiveness of the head CT choice decision aid in parents of children with minor head trauma: study protocol for a multicenter randomized trial. Trials. 2014;15:253. Utilize a systematic approach for evaluation of trauma patients to reduce missed injuries in multiply injured children. Identify and manage traumatic brain injuries, orthopedic injuries, and musculoskeletal injuries in pediatric patients with multiple trauma. Date of Original Release: June 1, 2018. Date of most recent review: May 15, 2018. Termination date: June 1, 2021. Faculty Disclosures: It is the policy of EB Medicine to ensure objectivity, balance, independence, transparency, and scientific rigor in all CME-sponsored educational activities. All faculty participating in the planning or implementation of a sponsored activity are expected to disclose to the audience any relevant financial relationships and to assist in resolving any conflict of interest that may arise from the relationship. Presenters must also make a meaningful disclosure to the audience of their discussions of unlabeled or unapproved drugs or devices. In compliance with all ACCME Essentials, Standards, and Guidelines, all faculty for this CME activity were asked to complete a full disclosure statement. The information received is as follows: Dr. Tatem, Dr. Kapoor, Dr. Hughes, Dr. Zibners, Dr. Claudius, Dr. Horeczko, Dr. Mishler, and their related parties report no significant financial interest or other relationship with the manufacturer(s) of any commercial product(s) discussed in this educational presentation. Dr. Jagoda made the following disclosures: Consultant, Daiichi Sankyo Inc; Consultant, Pfizer Inc; Consultant, Banyan Biomarkers Inc; Consulting fees, EB Medicine.